Wood decks are great outdoor living spaces. Keep them looking their best with a yearly cleaning to remove unwanted mold, mildew and dirt. Reseal your deck every 3 years to keep your wood protected from the harshness of the sun and the effects of moisture. 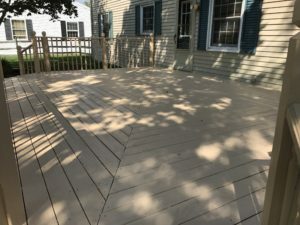 This regular maintenance schedule will ensure your deck will look its best and maintain its needed protection for years of enjoyment. Sealing your wood deck helps to protect it from the decomposing effects of the sun's uv rays and moisture. Even with pressure treated lumber if left unsealed after a few years it will begin to dry out, split and splinter. These are all signs of the natural decomposing process. Using a sealer with uv inhibitors and water repellency ensures the maximum life and use of your deck. 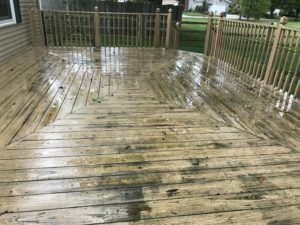 Call today to get a free quote to seal your deck.